ARM designs display processors for SoC designers, to incorporate alongside the CPU and GPU cores it is more famous for. Yesterday ARM announced a completely new display processor architecture dubbed Mali-Cetus. Though it is yet to incorporate information about any specific next-gen display processors on its site, ARM has shared with us various information and press materials concerning Mali-Cetus. The Mali-Cetus display processor offloads composition and image processing functionality from the GPU/CPU, just like previous Mali-DP SoC components but designed for the 4K HDR VR future, and with considerations towards the popular Android OS, an important driver for ARM SoC proliferation. ARM's design team are always looking at power efficiency and a Mali-Cetus display processor offers flexibility, intelligent resource sharing, and power saving techniques when driving a single or dual display. Furthermore, ARM knows its partners like to offer differentiation so is facilitating this via a co-processor interface. 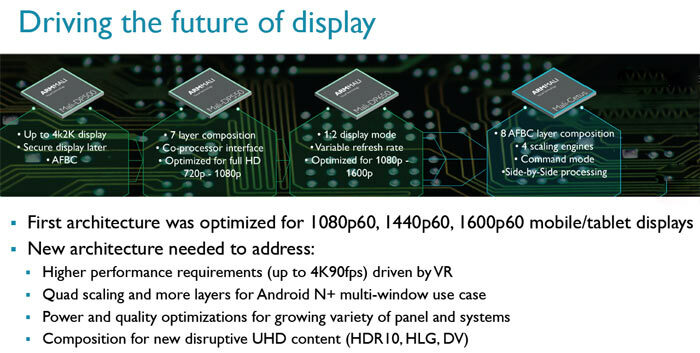 With the new Mali-Cetus display processor available, ARM will be able to supply more SoC components suitable for the booming 4K HDR smart TV, Android TV box, and VR headset markets. The next marketing excuse to sell us all more stuff. (Cries) At least it's a positive and sensible improvement. Pick one? Can't be an excuse if it's genuinely good, or so I thought. honestly, this is very unnecessary atleast on handheld platfrom. the power draw and heat output will most likely be more than an issue. Actually it makes a lot of sense for people who want to hook up their phones\tablets to large displays. Travelling media \ business presentation system.